unemployment – Len Bilén's blog, a blog about faith, politics and the environment. Unemployment rises to 7.9% in spite of a rise in part time jobs. The jobs they created are part time: Not fine. Instead of insurance we’ll all pay the fine. Posted on November 2, 2012 Categories Obama, politicsTags Limericks, Obamcare, politics, unemploymentLeave a comment on Unemployment rises to 7.9% in spite of a rise in part time jobs. The good news yesterday was: Unemployment down to 7.8%!!! In a month when nothing happened that could possibly explain this sudden and totally unexpected improvement, one has to ask: What happened? I went to the Bureau of Labor Statistics official website: http://www.bls.gov/web/empsit/ces_cps_trends.pdf and picked up the real story. In it they show that the payroll survey showed an increase of 114000 jobs and the household survey a giant one month increase of 873000 jobs, a number not seen since the Reagan recovery in the eighties. The household survey yields a volatile number for a variety of reasons: It only samples 60000 households, and what constitutes employment is not well defined. Aware of this, the BLS is developing an adjusted household survey employment number with the following definition: This is a research series created from household survey employment to be more similar in concept and definition to payroll survey employment. Household survey employment is adjusted by subtracting agriculture and related employment, nonagricultural self employed, unpaid family workers, private household workers, and workers absent without pay from their jobs, and then adding nonagricultural wage and salary multiple jobholders. The effects of population control revisions also have been smoothed out in the historical data in this series. The discrepancy is 579000 jobs, enough to state that the most probable official unemployment number should have remained at 8.1%. Unemployed, discouraged, discarded. A Limerick. you count as “discouraged”, a case less severe. No more unemployed, but a discard. So there! Posted on January 31, 2012 January 31, 2012 Categories limerick, PoliticsTags Limericks, politics, unemploymentLeave a comment on Unemployed, discouraged, discarded. A Limerick. Hard times for Paul Krugman. A Limerick. 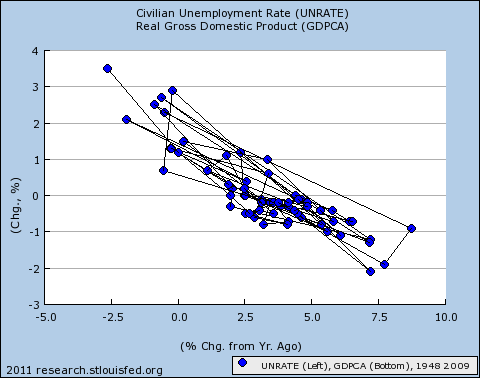 Paul Krugman Jan 2, 2011, NYT: The figure at right illustrates Okun’s Law — the relationship between growth and unemployment. (Gah — I’ve tried to remove the connecting lines, to no avail.) The horizontal axis shows annual growth rates of real GDP; the vertical axis shows the year-to-year change in the unemployment rate. Two things are clear. First, the economy has to grow around 2 1/2 percent per year just to keep unemployment from rising. Second, growth above that level leads to a less than one-for-one fall in unemployment (because hours per worker rise, more people enter the work force, etc.). Roughly, it takes two point-years of extra growth to reduce the unemployment rate by one point. So, suppose that US growth is accelerating. Even so, it will take years of high growth to get us back to anything resembling full employment. Put it this way: suppose that from here on out we average 4.5 percent growth, which is way above any forecast I’ve seen. Even at that rate, unemployment would be close to 8 percent at the end of 2012, and wouldn’t get below 6 percent until midway through Sarah Palin’s first term. Update: This would make unemployment go below 6 % Jan 2019.
and all of his readers started to squirm. Next thing you tell us: “She is a bookworm”. 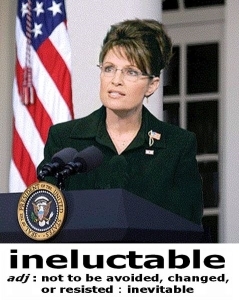 Posted on January 27, 2012 December 5, 2015 Categories limerick, Politics, Sarah PalinTags Limericks, Paul Krugman, politics, Sarah Palin, unemploymentLeave a comment on Hard times for Paul Krugman. A Limerick.